Natural resource demand, environmental issues, retirements and low enrollments support geologists. Geologist salary graph: Graph of average annual salaries of geologists in the petroleum industry as published by the American Association of Petroleum Geologists as part of the AAPG Annual Salary Survey. These represent employees in the petroleum industry with zero to two years of experience. These new employees hold a mix of bachelor's, master's and Ph.D. degrees. It's Still a Good Time to Be a Geologist! Although the news is full of stories about recession and unemployment, the demand for geologists is stronger than in most other business sectors. There have been layoffs, especially in the mineral resources sector; however, the long-term outlook is good and will strengthen as economic conditions improve. Salaries and demand for geologists often mirror the price of geological commodities such as fuels, metals, and construction materials. At present, low prices for some of these commodities have resulted in layoffs. However, those same low prices support demand. As economic conditions improve, demand and prices should both increase to create an environment of renewed hiring. There are also many jobs for geologists outside of the mineral resource sector. These jobs are in the environmental, government, and education sectors. Increasing environmental concerns and government regulations are driving the demand for these geologists. At present there are many interesting, good-paying jobs, and the outlook is good for newly degreed geologists. Drill platform: The highest average annual salaries for geologists are usually found in the petroleum and mineral resource sectors. The prices of geological commodities exert a heavy influence on salaries. 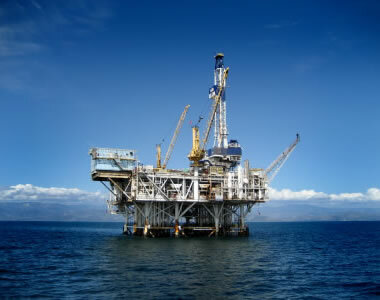 This image shows an oil platform in the Pacific Ocean off the coast of southern California. Photo copyright iStockphoto / Chad Anderson. How Much Are Geologists Earning? Geology salaries vary by employment sector. The graph on this page shows the average starting salary of a petroleum geologist with zero to two years' experience. It clearly shows that oil companies are willing to pay handsome salaries to new geologists. At the time of the most recent AAPG salary survey, new geologists were earning an average of about $83,000. Similar salaries were being paid to new hires in the mineral resource sector. The new geologists earning these salaries were a mix of B.S., M.S., and Ph.D. geologists. A large number of geologists work in the environmental and government sectors. These employers tend to pay 10% to 40% less because they are not in such a demand-driven market. However, employment in the environmental and government sectors is often more stable than the prices of commodities. Environmental geology: Environmental geologists prepare hazard assessments, assist in the planning of large construction projects, develop solutions to environmental problems and assess contamination problems. The demand for their services is driven mainly by legislation and government regulations. These jobs are increasingly done in urban areas where many people interact with the earth. 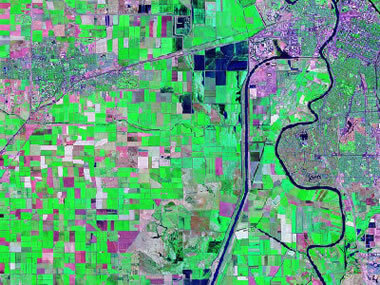 This image shows an area near Sacramento and Davis, California, showing a mix of urban, industrial, and agricultural land uses. Landsat image from the NASA Geocover Program. Are People Rushing to Become Geologists to Earn this High Pay? There is a "professional pipeline" for geologists. To qualify for a geoscience job, a person must earn at least a bachelor's degree. Many earn a master's degree to compete more effectively in the job market. This education typically takes between four and six years. So, anyone who enters the "pipeline" now will not reach the job market for a few more years. Although projections are optimistic, a person who begins working on a degree now could find a different employment environment upon graduation. A "rush to become a geologist" is not evident in university enrollments. For the past ten years, the number of people enrolled in geoscience programs has been close to steady as documented by the AGI enrollment survey. A flood of new geology graduates is not in the pipeline to meet the expected demand. The AGI data also shows that about 20,000 people in the undergraduate degree pipeline has yielded only about 2,800 undergraduate degrees per year. If we assume that the average student declares a geoscience major about three years prior to graduation, the expected number of degrees per year should be about double the number produced. However, these are challenging programs, often requiring calculus, physics, chemistry, and other demanding courses. Dedicated students persist to a degree, but those with inadequate preparation or desire often select a new career path. Map of lahar hazards near Mount Rainier: Government and environmental geologists often assess the potential impact of flooding, volcanic eruptions, earthquakes and landslides. They do much of this work by investigating the geologic history of an area. Their work is often summarized in the form of a map, such as the lahar hazard map shown above (lahars are mudflows associated with volcanic eruptions). US Geological Survey image. Will the High Rates of Pay for Geologists Continue? It is difficult to predict the future. In the current economic environment, a leveling or slight decline in pay rates would not be a surprise. Demand for geologists in the petroleum and mineral resources sectors will continue to be driven by the prices of commodities. Logic suggests that these finite resources are becoming harder to find. Growth in population and affluence will put upward pressure on prices. There were major layoffs in the oil industry in 1986 and 1993 in response to price declines. In both instances, prices eventually recovered. Similar trends occur in the mineral resource sector. The conclusion: Based upon history, employment and salary levels are cyclical. There is another important factor in the oil industry "pipeline." A lot of geologists began oil industry careers during a previous time of high geologist salaries in the 1970s. These baby-boomer geologists are now reaching retirement age, and a disproportionate number of them will leave oil companies over the next few years. Replacing them, and their accumulated expertise, will be a major challenge for the oil industry. The number of geologists working in environmental jobs has been growing steadily for over a decade, driven by increased government spending and environmental regulations. Legislatures rather than commodity prices drive the employment of these geologists. Employment in these areas has steadily increased because citizens and governments are now more concerned about issues such as pollution, land use, and climate change. The ideals that drive the environmental movement are likely to continue, and that will support geologist hirings and salaries. Should I Pursue a Degree in Geology? The standard advice of selecting a career that you will love instead of one that pays a lot of money applies well here. Economic conditions change over time, and the demand for geologists will go through cycles. So, if you are going into geology because you think that you will earn a lot of money, you might be disappointed. However, if you go into geology because you love the subject and work hard to be among the best, then you should find many opportunities for interesting work.